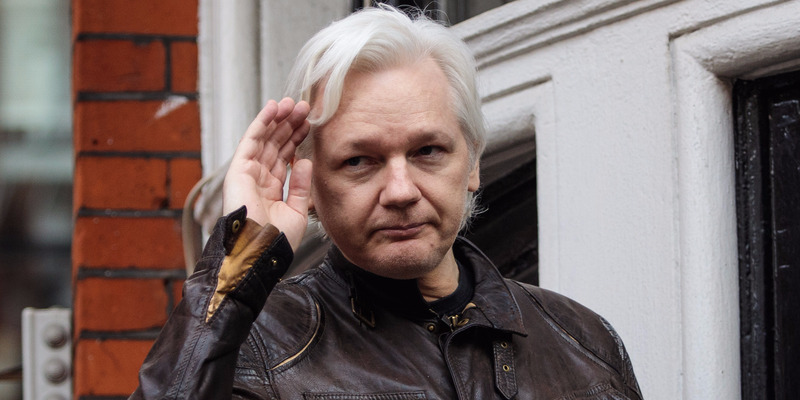 WikiLeaks founder Julian Assange’s Twitter account was deleted for a few hours on Sunday but returned Monday morning. The US Navy was also roped into the confusion when it inadvertently sent out a tweet with Assange’s name in quotes; the tweet was quickly deleted. Julian Assange, the WikiLeaks founder, disappeared from Twitter for a while on Sunday. Beginning about 8 p.m. ET, any attempts to view his Twitter account resulted in an error message saying the page did not exist. Assange’s brief disappearance from the social-media platform attracted attention. By midday on Monday, his name was trending on Twitter, and his account reappeared shortly after. The account seemed to be missing its followers at first, but they reemerged gradually as well. It’s unclear whether the incident originated from Assange’s end of Twitter’s. Twitter declined to officially comment on the matter. In November, President Donald Trump’s account was briefly deactivated by an employee on his last day of work who later said the situation was a mistake. Twitter has since said it has put safeguards in place to prevent a recurrence of that situation. The US Navy was inadvertently roped into the confusion as well. Early Monday morning, the Navy sent out a tweet from its official Twitter account with Assange’s full name in quotes. The mix-up didn’t go unnoticed by WikiLeaks. “Despite some oddities from the US Navy and Twitter today and increased physical surveillance @JulianAssange’s physical situation at the embassy remains unaltered–confined without charge in violation of two UN rulings requiring the UK to set him free,” WikiLeaks said.